Today I’d like to show you the booster pedal I made. It’s a straight clone of an MXR Microamp. The Microamp is a great booster pedal because it simply adds volume. You can use this to just increase the volume of your guitar for solos, or you can use it to overdrive your amp. The choice is yours. 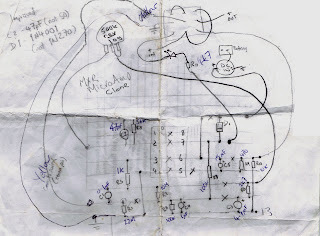 The circuit diagram for the Microamp can be found at www.generalguitargadgets.com. General Guitar Gadgets asks that other people don’t post their circuits elsewhere, so I won’t. 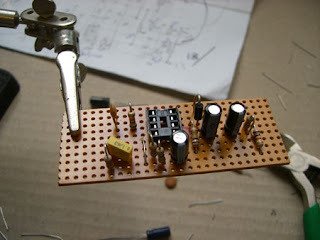 Just go to this page to get it: http://www.generalguitargadgets.com/index.php?option=com_content&task=view&id=70&Itemid=26 (click on “microamp schematic”). The circuit is pretty simple, using a single TL061 as the amplifier. You can buy a ready-made PCB from General Guitar Gadgets, which would make life a lot easier, but I decided I would just build it on veroboard (strip board) since it was a pretty simple circuit. 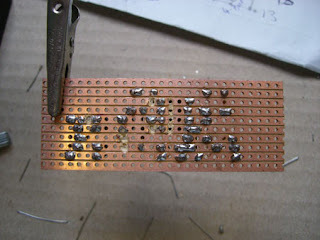 If this is your first time building a circuit, then just buy the PCB. You won’t regret it. I made a quick veroboard sketch of the circuit (yes I know, it's rough, but it's been confirmed as accurate). Anyway, here are a couple of pictures of the circuit during construction. At first I built this into a much bigger enclosure, but then I decided to try to fit it into a much smaller box. To achieve this, I had to squeeze the components a little bit closer together on the veroboard and then cut a bit off the board itself, as you can see in the following photo. It’s a really tight fit, but there’s just enough space to add a 9v battery (though I doubt I’ll do that). I then added a bit of insulation to make sure the circuit board didn’t make contact with the metal enclosure. I see a lot of people making their own stomp boxes, and doing a really good job, but then just leaving the box unpainted, or painted a single colour with no writing, or something scrawled on it like a child had done it. I figured I had done all this work on the electronics, so why not try and make the box look nice too? So, I painted the box black, then drew something up on the computer and printed it out on photographic paper (one side is sticky). 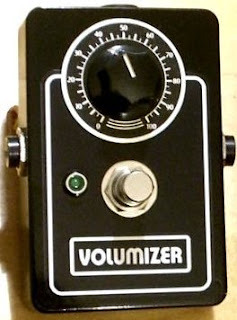 I didn’t want to rip off the Microamp name, so I called it the Volumizer. Here you can see it next to a standard-sized pedal (a Digitech DigiDelay) for size comparison. Just in case it’s not clear, the Volumizer is the smaller pedal.